Are you new to e-learning and bursting at the seams with questions? Are you looking for tips and tricks from someone reputable, who has years of experience creating real-world training? Here’s your chance! 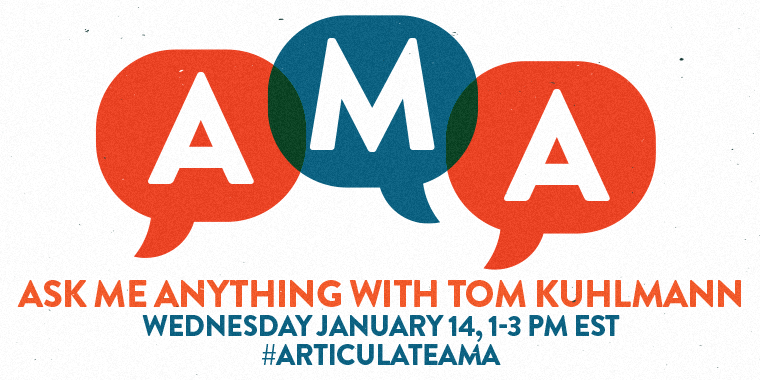 On Wednesday, January 14th, 2015, join Tom Kuhlmann for a live AMA event from 1-3PM ET in the E-Learning Heroes forums. Tom Kuhlmann, author of the Rapid E-Learning Blog, will answer your questions about getting started in the e-learning industry. From top time-saving development tricks to recommendations on what to include in your portfolio, Tom will be ready and willing to answer your questions and help you get started on the right foot. Mark the event date in your calendar and visit this page when the event begins at 1 PM ET on Wednesday, January 14th. When the live event starts, the comments will become enabled and you can post your questions for Tom. Tom will try to answer as many questions as possible during the session, starting with the ones people are most interested in seeing answered. You can help Tom determine which ones are most popular by using the “Like” button to vote for the questions you want answered. He’ll do his best to prioritize the ones with the most Likes! We hope you’ll join us for this fun event! Don’t forget to follow #ArticulateAMA on Twitter for all the most recent news and info about the event. We look forward to seeing you there! POST-EVENT UPDATE: Thanks to everyone for participating! This has been awesome. Feel free to continue the discussion and if you have new questions, please post them in our forums and the community will dive in. We’re also excited to announce that our next Articulate AMA will be with Articulate visual designer Greg Christman. If you love all the awesome illustrations and graphics you see on E-Learning Heroes, this is your chance to get input from one of the guys who creates them! Greg will answer all your visual and graphic design questions on Wednesday, February 18, from 1-3 pm EST. Don’t forget to follow #ArticulateAMA on Twitter for all the latest news and updates! Hello Danika That's a question we all the time at workshops and probably one of the biggest challenges for those who come from training and not graphic design. A couple of quick tips: Focus on clean design. Get rid of clutter and use consistent visuals. David has a great design map activity (we'll post the link) that helps you think through your design needs. This helps you be more intentional about what you have on the screen. I recommend Robin William's Non Designer's Design Book I also think making a habit of collecting things you like the look of and trying to replicate them helps build awareness and skills. That's one of the reasons I like the weekly challenges we do in the community. You see different ideas and approaches. Danika, you might also be interested in this article I recently wrote that compiled community tips for picking a look-and-feel for your course: 5 Ways to Choose Color Palettes for E-Learning: http://bit.ly/1x1u1O1 Lots of great, practical advice! If you're new to elearning how would you choose between Studio and Storyline? Considering the cost is the same I recommend Storyline. It's easy to do the easy stuff and as your skills increase the tool grows with you. PowerPoint based authoring is good, but when you need to do more interactive things you have some limitations and have to really hack it up. For example, there are three core types of interactions: click, hover, and drag. PowerPoint let's you click, so you lose out on other types of interactions. If you need the tool for SMEs who have a lot of PPT content and want to stick with it, then Studio is a good option. I am interested in creating a sales software training new employee orientation using Storyline, I would like for the process to be interactive, along with quizzes, and LMS functionality for tracking purposes. Are there any other starter templates available that are available on a "How To" technical level. What other tips and tricks would be available to get started with this project? You could mix and match the templates. Perhaps someone will create one specific to what you're asking. I'd start with the gate screen templates and modify those to be more like help boxes that a person could access during the training. There are some templates designed around quiz questions that you could pull into your course. That's the great part of Storyline being able to bring slides into your course via the import template option. As far as other tips, I think a lot of software training focuses too much on the features and not enough on how the user uses the features to do something job-related. I'd put the focus on the tasks they need to accomplish. How do you deal with the 200 page PowerPoint and the SME that tells you: It's all relevant? I used to train the SMEs to think more like instructional designers. We taught them a backwards design approach. I called it Bull's Eye training. Understanding by Design (book) does a great job and so does Cathy Moore's action mapping. Put together a simple presentation like Cathy did. They'd get it and then teach them to see the content in a different way. And then tell them that's how it needs to be structured for a course. Let them own looking at the content and determing what's most valuable. What do I need to know about tracking in the LMS? What do those different pass/fail options mean in the Publish section? Hi Tom, what recommendations do you have when designing eLearning material when trying to keep accessibility in mind? Accessibility is kind of a challenge for many organizations and how they approach the requirements. I prefer a multi modal approach where a training program is designed to best meet the various needs. I design different versions and let the end user choose which works best for them. Some organizations won't allow that so you get stuck building to the lowest common denominator and usually end up with a course that doesn't satisfy anyone's needs. Of course, if that's what you need to do then you start with linear content that is limited in interactions and media which require modifications. I'm sure there are some here who've done a lot fo accessible courses and can chime in with additional tips. Thanks Tom. I recently took my first kick at the accessibility can and it really made me think outside the box. It was a mind bender keeping audio, visuals and keyboard navigation in mind through the entire project. It was a great learning experience. I've actually submitted a few future feature requests to the development team, mainly centered around keyboard functionality for the storyline player. Thanks again for this opportunity...it's kind of like hanging out with the Wayne Gretzky of the articulate word:-) (Can you tell I'm Canadian...eh?) And if anyone else out there has recommendation or examples of well build accessibility/ 508 compliance feel free to share! Scott... as a fellow Canadian, you might appreciate this: https://www.youtube.com/watch?v=SCfGzQq7fZc . It always cracks me up... "I'm Gord?" What would be your recommendations for creating an interactive user manual document for sales software training with video "how to links", screenshots, etc. If I were to start over, I'd focus on more of a freelancing gig. If you have skills there's a lot of demand and opportunity. I like the way some of the community members have done it via the challenges. They write posts, share demos, files, and help others. It builds their brand and they seem to be working. They can chime in. Look at Jeff Korthenbosch, Jackie Van Nice, and Tim Slade as examples. I apologize to the others I didn't mention. When you build your brand you'll get opportunities and then can find the organization that gives you the most rewarding career. Thanks for the mention, Tom! Mitchell - I get more work than I could ever have dreamed of simply because I do exactly what Tom is suggesting. I wrote my little 3-Step Formula for Getting Work as a Freelancer not long ago. It sums up my approach pretty succinctly: http://www.jackievannice.com/?p=175067146 Best of luck to you! Hi Mitch - I think you've answered your own question! In fact, as a freelancer you'd probably have a better chance of getting the work you want. No one cares about your resume if your work shows you can knock it out of the park. If you can execute, you're not an imposter. Thank you both for your input, it has given me a lot to think about. I've seen many posts on this site about being a freelancer, but have never given them much consideration. I'll have to go back and read through them all again to get a deeper understanding. My courses are more "informational". What's the best way to enhance these types of courses since learners can't explore the information in a truly interactive fashion. Why can't they explore the information in an interactive fashion? We go online and digest all sort of informational content. Perhaps it's more about how the content is framed. Ask questions and give them reasons to explore to discover. Analyze how and why you interact with the content you do each day. See if there's a way to glean a technique from that. I used to record TV commercials and then storyboard them to figure out how they jumped from shot to shot and what may have motivated that decision. I may not have gotten in right, but dooing the deeper dive helped me think through how I'd present content. I'll give your suggestion about approaching it from a question some consideration. I've gotten pretty good at making the course look interesting and appealing to the eye. It's just the "click Next" (linear advancement) that I'd like to change a bit. Thanks! Linda, I struggled with the same concern about the NEXT button. I broke through the barrier by removing the NEXT button from the Player in SL2). I then asked myself " How will the Learner get the the next content of the course without using the NEXT button". I was amazed at how more interactive my course became when I used this exercise. Questions, interactive tabs, and consequence choices seemed to make more sense to me and made my informational course more interactive. Hhmm. More food for thought. I'm using Articulate Presenter but I'm sure this can be done as well. Linda, my courses sound very similar to yours. I've done a few in a magazine format where they have to turn a page instead of clicking next. I've also done tabbed interactions where they have to click on an image or a manila folder in a file cabinet to get to the information. Thanks for the suggestions. I've actually been able to incorporate Camtasia videos to change things up a bit. I use the media tour and media panel interactions a lot as well since they offer a bit more flexibility. When you're working with non-creative topics, it's hard to be creative sometime. Hi Tom How much interaction, whether through gaming or quizzes, etc., do you recommend in a course that typically runs about 30 minutes? As much interaction as makes it interesting, effective, and engaging. People like to touch the screen. Instead of next buttons, use a question. Instead of animations, make an object draggable. I also think that relevance is the best form of engagement. Sometimes we hide the irrelevance with bells & whistles that appear to do the trick. If you could narrow being a successful instructional designer down to one factor, what would it be? Knowing how to distill content into meaningful learning. And making it look good. :) We may talk a lot about instructional design, but the person who gets the job is the one who make things look good. I think a lot of training people are good at packaging information. But learning is more than information. A good instructional designer knows how to craft a learning experience. I like the 3C model as a simple reminder: challenge, choice, and consequence. Challenge the learner's understanding, give them choices, and the choices produce consequences. I have several topics that deal with state laws or rules. Are there some interesting ways to present this information? It gets boring very quickly! Hi Tom, What do you recommend for blending both audio narration and text slides in your training without the user thinking the "audio" is broke on the text only slides? You could add subtle ambient audio so they don't transition from narration to silence. I just completed a 5-module course that blended narrated and text slides. I used a simple image of a speaker with a circle and bar (the universal "not" symbol) on the text-only slides to indicate there was no sound. The customer wanted a navigation explanation slide at the beginning, so I included the symbol with the instructions. Seems to work for them. Are there best practices for the length of eLearns? I think that small, bit-sized modules are trending. They're easy to consume. I like to call them coursels, as in course morsels. With that the focus is on practical, just in time content. I think mobile will really drive that forward. I know a client/org that ONLY uses the word "coursel"! Tom wins!! I have just graduated from an ID program and I am interviewing for positions. I have a school portfolio, but are there specific types of samples you look for in a portfolio? Don't show long courses. No one wants to look at those. Create a bunch of mini modules that focus on specific things: drag & drop interactions, interactive video, etc. The weekly challenges are great for portfolio fodder. Find 6 that you like and build out nice looking mini modules. One other thought: school projects tend to look like school projects. They also tell the person interviewing that you're a student, which may introduce the bias that you don't have enough experience. Do a search for some portfolio sites and see how people position themselves visually. You want a polished/pro look that says you're experienced and capable. Hi Tom - What's the best way for eLearning designers to find work and build their portfolios? I mentioned above: get connected, show your work, and share. Again, I'll plug the weekly challenges and how some of the participants leverage those. It's a great way to connect with others and solicit/offer feedback. You get to show what you can do and potential customers see that. Add you can always add to your portfolio. You build good will that gets repaid when you help others. Some of the participants do their own blog posts on what they did. That's a great way to demonstrate your skills and get exposure. David sent me a couple notes recommending I jump into the challenges. I suppose I'll have to take you guys up on this, now! Thx, Tom! Paula, you could also find non-profits, schools or teachers in your area who need your expertise and volunteer to develop projects for them. While you may not get paid initially, you can certainly use that work to build your portfolio. Good luck! I mentioned this on one of the other questions: I created a two column list page. In one column I listed all of the skills job postings listed and in the other I matched to my skills/experience. Where I was lacking I pursued opportunities to build them. A lot of that came from volunteering and doing free projects. Check out the LinkedIn group Global Giveback for ID volunteer opportunities. Its meant for non-profits, NGOs, etc to ask for assistance with training development for their organizations or programs. Hi Paula! We'd love to see you take part in some of the weekly e-learning challenges, as mentioned by Tom. Here's the link if you're interested: https://community.articulate.com/hubs/e-learning-challenges Also, here's a few articles and discussions that might be helpful for you! Show us your e-learning portfolio: https://community.articulate.com/articles/show-us-your-elearning-portfolio Do you have an e-learning portfolio? Share your links here! : https://community.articulate.com/discussions/building-better-courses/do-you-have-an-elearning-portfolio-share-your-links-here Might give you some additional ideas!! Hi Tom, I would love to learn how to use Articulate (and Captivate and other e-Learning programs) but I work in an institution that doesn't have these programs. I've already taken advantage of the free 30 day trials. Do you have any advice as to how can I find a "jr" position in instructional design/technology to gain the kind of experience I want without relocating? I try to do what I can with the technology available to me but it's not enough. How about some tips for content that is serious, text heavy AND state regulatory type information. One approach would be to reframe the content into situations or scenarios where using the content or not using it has consequences. Or flip it. Here's one of my favorite examples from the community. Someone worked for a mattress company. They were working on bed bug training (apparently bed bugs just hang out in the unemployment line without it). They guy asked for ideas to make it more creative. Someone suggested that he present the content as if he was a real estate agent for bed bugs. Great flip. How can you flip the perspective on the regulatory training? Hi Tom, Any suggestions from your experience on creating better inter-departmental communication. Our team is dealing with a lot of "This goes live tomorrow, but we've known about it for months. We need an online course tomorrow." Since I am new to eLearning designing, is it really necessary to understand things like the HTML coding, etc.? I feel like a fish out of water when I hear or read stuff about that, but I don't know that it is really necessary to know it. Thank you! You guys are all so great at Articulate! Often training teams are reactive to the organization's needs. It's important to be proactive. Find a seat at the table of key initiatives and projects. This helps keep you in the loop. Also make sure to toot your horn so people know what you do and the value you bring. Sometimes we're in the shadows. "Since I am new to eLearning designing, is it really necessary to understand things like the HTML coding, etc.?" I think the tools today make it easier to not learn to code. However, you should have some basic understanding of some of the tech related to elearning design and delivery. Tom - Do you have any sample stories of Orientation Courses? Not sure if we have any orientation demos in the elearning example section of the community. Perhaps one of the community members has something to share. Nicole, Great. Thanks for your help! In my opinion, e-learning is not the right medium for delivering new hire orientation. If you do research on new hire orientation, you'll see that orientation is when new employees are set on the track of success and failure in their new organization. It's hard to begin integrating new hires into a company's culture without some genuine human interaction. What would be more effective: a company representative saying, "We're glad you decided to join our organization" or a computer saying that? With that said, I think that e-learning might be right for delivering parts of a new hire orientation...the payroll course above is a good example. That example would be even better if new hires could actually fill out their tax forms, their direct deposit info, etc. via the course (similar to how modern tax preparation software is designed). Agree, Paul. Orientations should be heavy on accessible resources and human support. A few small modular components might be really effective but without the human in the mix and really solid on-demand support materials, elearning stuff will probably fall short. As a beginner who may not have work product to add to a portfolio, what suggestions do you have for showcasing your new skills and abilities? I'd jump into the weekly challenges (or do something like it on your own). Build some nice interactive prototypes and then a portfolio to show them. Keep them simple and easy to go through. Focus on making them polished since you want them to represent your skills. Network. The community here is pretty active and represents the top organizations in the world. We're in something like 30,000 companies. So you get broad exposure. Hi Tom, I am new to 508 Compliance. I understand how to input alt text into graphics. I would like to understand what should say when entering alt text. I also would like to know what I should enter as alt text when I am inputting alt text on a menu item on a slide that jumps to another screen? A colleague and I recently purchased Storyline 2. There was some confusion from our IT department on the installation of "Replay" and "Character Bundle Volume 1". The IT rep was initially unsure which "Replay" I needed and ultimately didn't install either replay or the character bundle! My question is; which version of "Replay" do I need and isn't the installation of both essential? Hi Kristin, Replay is an amazing simple video recorder and editor that comes free with Storyline. Always install the latest version (https://en-uk.articulate.com/products/replay.php). Replay is a stand-alone program and is not essential to work with Storyline. The Character pack is an add-on for Storyline. Without it you'll only have one photographic character in your character library. If you've got it... install it! Hi Kristin. Replay is a separate product from storyline and is not needed in order to use storyline. You should certainly install the Character Bundle though. It's well worth it. Replay is a nice little tool if you want to record screen capture videos (you can even incorporate a webcam) and do some minor editing. These projects are external from storyline and you can give them a quick publish as a MP4 file. It's a fun little tool. I teach Excel in an online course...I use it all the time...that and Screenr (another articulate service)! Along with Jennifer Lamb - I develop eLearning on how to complete forms (medical data) which can be boring. I need sharp, professional, non-cartoony style. Ideas for engagement? Using Studio 13. The design map activity is good to help you determine what you need it to look like. [link will follow]. Then I'd reframe the content so it's relevant. Also consider flipping perspective. What happens if things aren't done right? You could play CSI and analyze a messed up customer/patient situation and investigate what happend, who was involved, and why it happened. Lori, I had to create a course on how to complete some of our account documents. It was nice to be able to use the text / data entry features in Storyline to make the users fill the form out based on the scenario given. Hi Tom, How would you approach designing a course for second language acquisition (or any other type where learners are beginners)? When you design for beginners you may not want to dive the learners into scenario/exercise right away. You need to present the information first then test it. It can easily lead to a boring click and read. How would you deal with that? Thank you! I think they still need to use the content so I'd frame it how they use it. If there are language issues, then it's more about how to structure the content so they understand. But content and context are a bit different. Hi Steffanie, Branching the content is a great idea! But still, I'm a tad worried about learners-beginners getting into bad grammar habits, if it makes any sense. I've developed courses with "ask a teacher" button linking to lightboxes with extra info - it seemed to work ;) Also, I'm thinking about scenarios revolving around basic English grammar. I guess all non-grammar things can be put into a dictionary. I wish we could put there sound files... Good luck Steffanie!